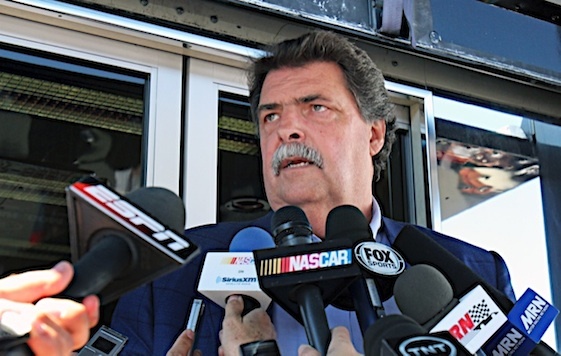 NASCAR president Mike Helton says his series is not at odds with new team-owners group. Some observers have speculated that this could lead to some kind of unionization or franchising of the teams, both of which have been rejected by NASCAR over the years. Helton said it was important to answer some of the questions that have arisen since the RTA was announced. He made a statement and answered questions from the rear of the NASCAR hauler in the garage area at New Hampshire Motor Speedway, where the Sprint Cup and Nationwide series race this weekend. Helton says NASCAR “will stay the course” in its governance of the sport in wake of RTA formation. “We believe the way we’ve grown motorsports has worked … we will stay the course on how we do business,’’ Helton said. Helton said the RTA, which includes Chip Ganassi Racing with Felix Sabates, Hendrick Motor Sports, Joe Gibbs Racing, Michael Waltrip Racing, Richard Childress Racing, Richard Petty Motor Sports, Roush Fenway Racing, Stewart-Haas Racing and Team Penske, advised NASCAR of the announcement in advance but has not had any discussions with the organization. “I caution everyone on the perception of things,’’ said Helton, adding that there is no animosity from either NASCAR or the RTA. Rob Kauffman, co-owner of Michael Waltrip Racing, has been elected the first chair of the RTA. “With the encouragement of NASCAR and the manufacturers, the teams have met in various forms and forums over the years to explore areas of common interest. This simply formalizes what was an informal group.” Kauffman said. “The key word is collaboration. We all have vested interests in the success and popularity of stock car racing.